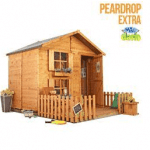 With a very interesting and high quality look the, 5 x 5 Waltons Honeypot Rose Wooden Playhouse is going to be the perfect addition to your garden. The kids will love to put down their video games and get outside to play in here and let their imaginations run wild. No matter if they are hosting a tea party for their favourite stuffed animals or if they are using this as some kind of top secret base to plan out how to take down the bad guys, a lot of fun is going to be had with this. With its generous amount of floor space, height and three large windows to let in sunlight, this is a playhouse that really is going to provide years and years of fun. Even though this is slightly larger than some of Waltons other playhouses, they have managed to keep things high quality without raising the price significantly. With its strong tongue and groove shiplap cladding and robust frame, you have a structure that is not only very strong, but also something that is going to last a lot of years as well. Every design choice has been made with kids play in mind so they have made sure to make things like the roof and floor very sturdy, the door be easy to open and close, no glass in the windows and in general ensure the whole playhouse is kid friendly. The 5 x 5 Waltons Honeypot Rose Wooden Playhouse is a very special kind of playhouse, the kind of playhouse that is going to make the kids want to stop playing their video games and get outside and use their imagination. 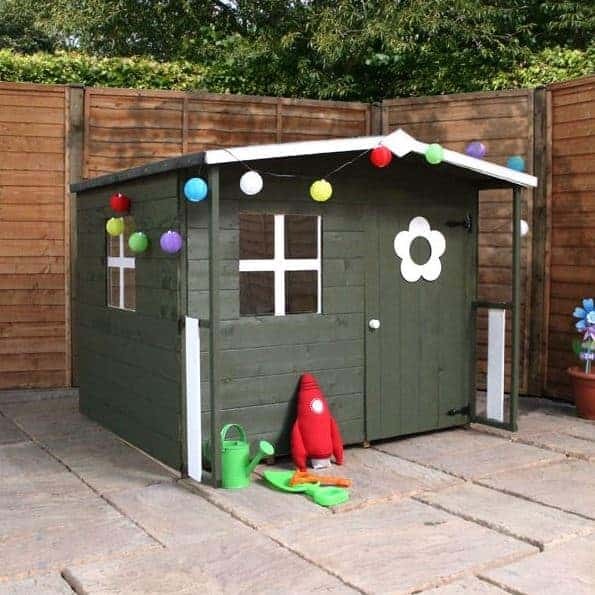 We really love the style that Waltons have gone for with this playhouse and think that in some ways they have given it a cabin in the woods type of look. The fact that the timber used has been planed and smoothed gives it a very appealing look as well as taking away the risk of splinters. This is a little larger than some of their other more compact playhouse, but at the same time you do not have to worry about this taking over the garden. You have a very interesting, square kind of shape with this as the width and the depth are both right around 5 feet. This gives the kids plenty of room to store a lot of toys, have their friends over or even have a table and a set of chairs. 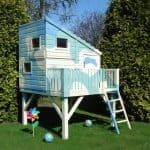 The headroom that is offered by this playhouse really is quite surprising as at its highest point it is, 4 feet 2 inches and even at the eaves there is 3 feet 9 inches of headroom. This little bit extra height means that the kids will not outgrow this as quick as some other playhouses. On the front of the playhouse we are sure you have noticed those extra sections that are on each side. To be honest with you these do not really add anything from a structural point of view to the playhouse, but we do really love the way they look and are sure there is just a ton of things the kids could hang off them. We are sure that you have noticed the very interesting roof that is on here. This is an apex style roof, but it is not as steep as what you would normally expect. We have seen Waltons use this a few times now and the look and the added headroom it gives really is very impressive. The roof is comprised of 8 mm thick, solid sheet board and then covered with sand felt to protect the boards from the rain. This is a strong roof and the heaviest snow will not even have any kids of effect on it, well apart from the kids trying to scoop it off to throw at you of course. You really cannot go wrong with 12 mm thick tongue and groove shiplap cladding from a practical point of view and of course from a looks standpoint as well. We really love to see some tight, well put together tongue and groove shiplap cladding and that is exactly what is used to make up the walls. It is strong, water proof and as you can see from the pictures, it looks just fantastic. Anything that is made for kids to play with or in has to be of a strong design and strong is certainly the best way to describe the 28 mm x 28 mm frame that is inside here. This is something of a trademark in all their playhouse and we love it every time we see or hear that a playhouse has it. This frame makes this a robust structure and it will ensure that it is able to take a bit of a beating over the years. You can tell kids to calm down until you are blue in the face, but as soon as your back is turned the rough play starts right back up, but at least thanks to this frame, you know the playhouse can take it. We are very impressed at how Waltons have used 10 mm thick solid sheet boarding for the floor instead of 8 mm like in the roof. This gives the kids a very strong surface to play on and also it will take the weight of the truck load of toys that they will want to bring inside. The playhouse will not be painted like in the pictures before it is sent to you, but the timber will be given a water based treatment so that the wood is well protected during delivery and installation. Once you have built the playhouse a coating of wood treatment should be applied to keep the playhouse rot free. Doing this once a year will make sure the kids can enjoy this until they are too large to fit in the door. You do get a ten year anti rot guarantee with this, but in order to validate it, you must treat the playhouse. The interesting shape of the roof means that the door can be a few inches higher than you would normally get on a playhouse. Most playhouse doors are around 2 feet 5 inches, but this one here is 3 feet 2 inches high. The width of the door is 1 foot 9 inches high which if we are honest is actually a couple inches smaller than we would like to see. Still the kids will have no trouble getting in here. The door is very well designed in that they have used strong hinges so that it will stay in its place. Also the door is very nice to look at with its large door knob and flower decoration. The 5 x 5 Waltons Honeypot Rose Wooden Playhouse has three 2 mm thick, anti shatter styrene windows. These are done in a Georgian style as you can see in the pictures and we love that cross effect that they have in them. These windows will allow plenty of natural light inside, let the kids see who is coming to play and as they are made with styrene they will not shatter and have glass all over the place. We always feel that leaving expensive things like video games or iPads in a playhouse is a very bad idea as most of the time there is no lock on the door. This is the case here which may sound like something we would hate, but actually in our experience a lock on a playhouse door can end up as a headache for mum and dad if the kids cannot open it easily. While there is three windows on the playhouse there is only one on each side. Playhouses that have more than one window preside are very easy to look into. This one is going to offer the kids a little bit more privacy due to the window placement and the cross effect in each of them. Waltons are one of the more strict manufacturers when it comes to allowing you to tinker with the design of their playhouses. We do not see this as a bad thing however as it really is a lovely looking playhouse. Plus at least you know there is going to be no awkward or tricky design decisions that you have to make. While not essential in our opinion, Waltons do have a few extras available with this playhouse. 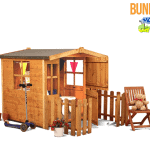 There is the option to have them install the playhouse for you at a cost of, £109.99. 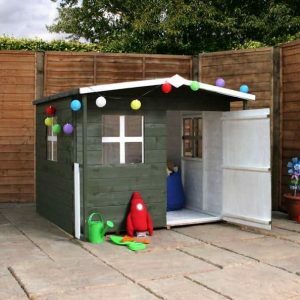 If you want to give the floor a bit extra support or if you think you may be moving the playhouse at some point then their portabase is worth considering and can be added for, £74.95. Lastly we have their superior roofing felt which is 10 mm and comes in, charcoal which is priced at £34.99 and olive green which is £69.95. We are very pleased and impressed with the overall quality of this playhouse, even though this is reasonably priced, we do not see any corners that have been cut in its design. Even though kids can play rough, we feel that this is going to last for a very long time. It is very strong structurally and as long as you treat the wood it will star rot free. 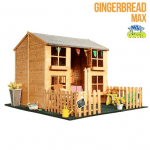 Most of the other playhouses in this price range are usually 4 x 4 so getting an extra foot of width and depth is something we really like as it gives the kids even more roof to play or fill up with toys. As long as you and the person helping follow the instructions and are sure to have the odd tea break, we do not see you falling out or taking more than 3-5 hours to build this. 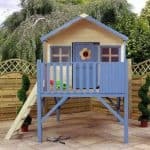 This is a very good sized and high quality playhouse which at £214.95 is offering excellent value for money. Final Thoughts: We really love the 5 x 5 Waltons Honeypot Rose Wooden Playhouse it is the little things in its design that make it stand out. Things like that apex roof and the two extra sections at the front are subtle, but they give this a style all of its own. The 5 x 5 size of this is just fantastic and inside is going to feel huge to the kids. They are going to have so much fun playing in here and as a parent or guardian, you get to have just as much fun watching them. 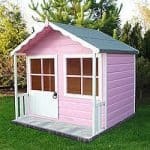 While this may be just over, £200, we still feel that this is an excellent shed and that the price is very reasonable for what you are getting.